Can measure to a max. of 15 m. One switch can measure multiple points. (a maximum of 6 points) Optimum for a flow of liquid or foam. Models with a cable float for one point only are also available. 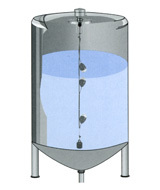 When the float rises and reaches to the upper limit of the range according to the liquid level, the float inverts. The movable weight inside contacts the magnet, and turn the upper limit signal on. When the level drops to the lower limit, the float inverts. 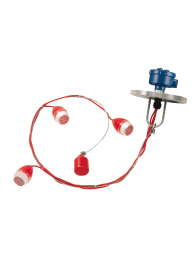 The movable weight inside moves away from the magnet and turn the reed switch off. Since the movable weight inside only moves at the upper or lower limits of the range, it is unaffected by chattering by waves. There is a flow of liquid or foam. *1: The Ln dimension refers to a length from the bottom of the flange. *2: The L dimension refers to the total length from the bottom of the flange. *3: The L-Ln dimension refers to the difference between the final setting position (Ln) and total length. Note: The values for *3 is true when the specific gravity of the liquid is 1.0.